The objective of this paper is to promote collaboration in policy and planning between business-oriented agriculturalists, conservation-oriented foresters, and climate change-oriented environmentalists. Lessons from multi-stakeholder initiatives in Bangladesh and Nepal illustrate the potential for scaling up organic matter value chains to foster more inclusive and sustainable agriculture. To eradicate extreme poverty means focusing on the millions smallholders so they can reliably generate more food and income. Agroecology emerges as the strongest pathway for leaving no one behind and meeting the triple challenge of productivity, sustainability and poverty eradication. Policy makers need to find ways to incentivise private sector investment which is (a) inclusive (creates opportunities for marginalised and smallholder farmers) and (b) sustainable (does not exacerbate degradation of the environment). Agroecological practices offer such a solution: they are accessible, sustainable and innovative. They build on the natural resources farmers already have, they do not depend on external inputs and they use both local and scientific knowledge. However, because of the limited need for external inputs and diversity of produce, agroecological practices do not lend themselves to private sector investment. They do not align well with commodity markets and trade, or programmatic delivery through finance or technology transfer. To engage the private sector in any type of agriculture activity we need to understand their motivations. Simply put, there needs to be commercial interest and profit. Clearly the private sector is interested primarily in production and income, but they are also interested in resilience, for long-term security. Facilitating market systems that enable companies to produce agroecological products or services. For example: 'alternative' products or services offered by distributors (e.g. agrovets), who in turn offer them to farmers; agreements between private companies and seed multipliers (farmers) for the planting material needed for agroecological production; 'buy-back-systems' (of agroecological products) so that companies are incentivised to promote agroecological knowledge services. 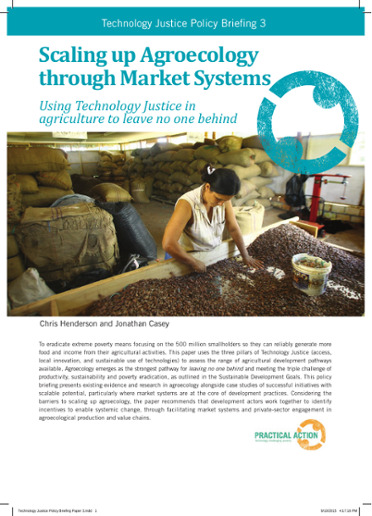 Encouraging governments to invest in, or provide incentives for, agroecology related technologies or services i.e. policy reform to promote agroecological agriculture. For example: replacing inorganic fertiliser subsidies with subsidies for bio-fertiliser or organic fertiliser; insisting that public R&D budgets are spent on agroecological research and development; providing product standards and regulation to create market led incentives for agroecological produce. Developing the ability of smallholder farmers to sell their produce - i.e. demand for agroecological products. For example: promoting the social marketing of agroecological products; or, where appropriate, encouraging companies to brand local products to improve the value and markets for local produce. Facilitating private sector engagement in agroecology is an ambitious objective because agroecology is not about access to a few key external inputs or maximising returns on investment. It is about minimising external inputs, and uses diversification as a strategy for optimising production and resilience. Providing the incentives for system change driven by markets and the private sector will require more ideas and strategies than those listed here. It will also require long-term commitment.